Neither November’s export slide nor Toyota Motor Corp.’s profit woes are what they seem. Corrected for yen appreciation, exports were down 8.9%, imports up 6.9%. Overall, Japan’s recession is mild and its fiscal stimulus modest. The yen’s strength is a sign currency markets see that in an economically sniffling world, Japan’s economy is the closest to rude health. At first sight, November’s 27% drop in Japanese exports suggests either Japanese uncompetitiveness or collapsing world trade. 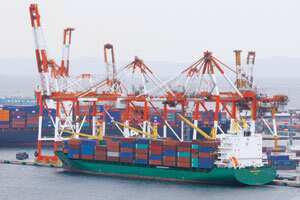 However, Japan’s trade accounts are in yen, which has appreciated by 24.3%. When corrected for this, Japan’s exports were down only 9% while imports were up 7%, an indication that Japanese domestic demand remains robust. The currency markets aren’t stupid; the extraordinary yen strength reflects Japan’s stronger position than most of its competitors. Low Japanese interest rates are above its competitors’ in real terms, while fiscal stimulus totalling 2.5% of GDP is modest by Western standards. Not only should Japan’s recession be milder than elsewhere, but the subsequent hangover from excessive deficits and negative real interest rates should be correspondingly less painful.